Whisky Kisses – A Mature Scottish Musical. 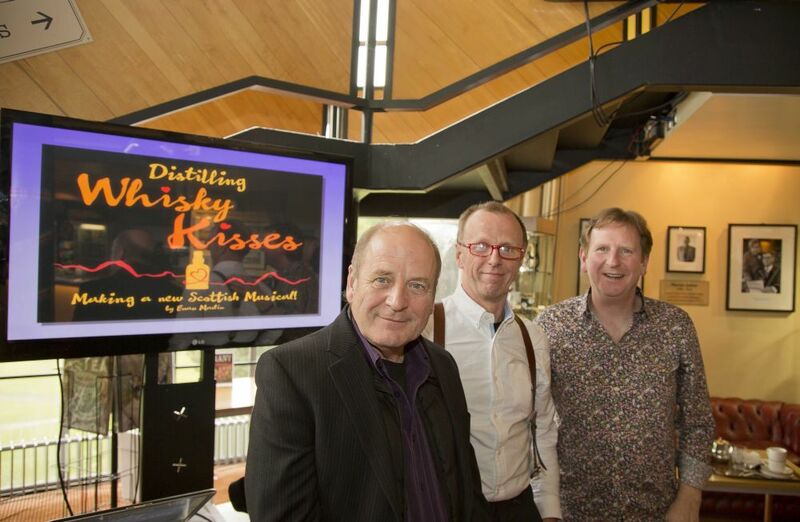 Pitlochry Festival Theatre’s summer offering for 2014, Whisky Kisses, certainly cuts it big time. A finalist in the 2007 Highland Quest competition, the now finely matured musical is delightfully full of vibrant and highly explosive energy. Indeed the storyline and musical score tear the heart out of tartan Scotland then put it back together seamlessly. Inspired by New York’s Tartan Week, the Moray based Rightlines partnership comprising writers Dave Smith and Euan Martin plus Edinburgh based composer James Bryce have taken Sir Walter Scott’s romanticised view of the Highlands to the cleaners. Indeed Mairi Morrison who plays Mary, the inheritor of the cash strapped Glenigma Distillery, literally hangs Glenigma’s tartan out to dry on the village washing line in full view of the audience while an oblivious pseudo Scot looks on in the form of New York tycoon Ben Munro played by Dougal Lee. Nessie – the Loch Ness Monster – makes a quite forgivable but thankfully brief appearance as do some empty whisky barrels and there is an oblique reference to ‘President Salmond’. 2014 is after all Scottish Referendum Year so all is forgiven. The plot follows a brave but narrow path between tartan for tartans sake and tartan because it makes hysterical sense. The story concerns two cash rich entrepreneurs competing to buy the very last bottle of the 100 year old Glenigma malt in the entire universe. The Scottish Government intervene unhelpfully and the heir to the family fortune must decide how to proceed with the saving of the glen. Without giving too much away, it is fair to say that it all works out in the end. There are subtle twists of course and a few tear jerking moments including the near demise of Mr Yomo, played by Siu Hun Li, on the slopes of Ben Igma. As with all Rightlines Productions however, there is a deeper message which in the case of Whisky Kisses is the question of how to live with heritage, how to share it, and how to enjoy it; while also knowing when to let it go, and to stop living in the past. The opening song ‘I gotta have it’ gives way to the concluding ‘Spirit of Living’ with ‘Alcoholics Synonymous’ and ‘The Road To Love’ in between. Set design and lighting are slick and vibrant and the Pitlochry Theatre sound is as always superb with not a word missed. Sound designer Paul Hoolihan and Musical Supervisor Jon Beales are to be congratulated. Whisky Kisses is a polished piece and after a near decade in the making it suffers from very few issues. Perhaps the Brokeback Mountain scene is a little subtle. However all in all, the 100 year old Glenigma malt has matured nicely since its initial 2010 tour of Aberdeen, Moray and Deeside. Directed by John Durnin and with set design by Ken Harrison Whisky Kisses performs at Pitlochry Festival Theatre until October 18th.